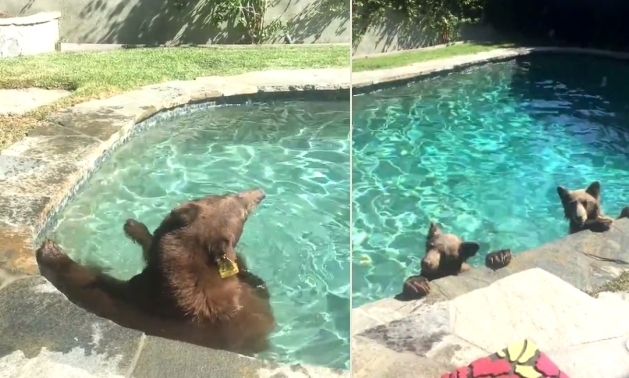 A mama bear and her cubs made themselves at home at a Monrovia residence, even enjoying a quick dip in the pool! The homeowners who shot this video said they found the mama bear poking her head through an open door Saturday on Oakleaf Avenue. Needless to say, they quickly shut the door. But that didn't deter this family of playful bears. The cubs continued to make themselves at home in the yard, swimming and splashing around in the pool! As you can see in the video, the mother bear does have an ear tag, so she is known to fish and wildlife officials. Responses to "A mother bear and her cubs float gracefully around a backyard pool"